Disappointing main acts but great shows by up-and-coming bands, lovely interviews with bands as Mogwai, jam sessions, sore feet, sauna-hot weather, amazing Roskilde volunteers, and dust, lots of D.U.S.T. – that’s what my 27th Roskilde Festival was about. The profile has changed over the years. In the nineties you could see Release bands like Front 242, Front Line Assembly, Covenant and Apoptygma Berzerk, but the last ten years have seen a shift in musical direction with more focus on bands and artists appealing to the younger generations. Still, we had Chelsea Wolfe, Massive Attack, Mogwai, Nick Cave & the Bad Seeds, Myrkur, Four Tet and above all Nine Inch Nails. This change has affected much more than the opportunity for bands from the darker electronic scenes to play the festival; the hard rock imprint that was the epitome of the Roskilde Festival for almost three decades is gone lest for a few acts, and the broad world music scene with bands from many African countries has almost faded away and will probably be gone in just a few years. Instead there has been a massive upsurge of bands from the R&B, alternative pop and hip hop scenes to mention a few genres. It’s not necessarily bad, the festival even sells out months in advance compared to previous years, but for Release readers it probably means less interest of going to the festival as it unfolds today. 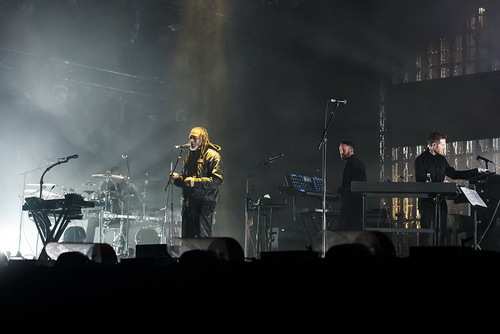 However, the Roskilde Festival 2018 edition offered a few great opportunities like Massive Attack, and Nine Inch Nails alongside bands we – me and the photographer – never attended, either because there was too much people at the venue or we didn’t have time to cross the festival ground and make it between concerts (Myrkur, Four Tet). The first interesting act played the Arena stage already on the first day of the festival. Trent Reznor and his Nine Inch Nails entered the stage at 00:30 and pulled off something that no other act could compete with after that. Nine Inch Nails has been leading pioneering act in industrial rock music since the debut album “Pretty Hate Machine” in 1989. Back then there was a holy rule – never mix electronic sounds with heavy guitar riffs – but he did just that, cut and pasted together with noisy industrial sounds. Although NIN put lots of effort in staying alternative not become a commercial rock act, they have failed completely and sold millions of albums already from the start. The last two years have seen releases of EP’s “Add Violence” and “Bad Witch” adding to the experimental side of Reznor’s creations, but that usually turns out to be commercially viable in the end anyway. The show was an amazing explosion and entailed many of his major hits as “March of the Pigs”, “Wish”, “The Hands That Feed” and “Gave Up”, just to mention a few. The light show was moderate by NIN festival standards (I recall the Reading Festival a few years ago), but the toned-down show worked perfect together with the slow and dark songs and the overused fog machines. It’s the moments between all the ferocious power and the intense buzzsaw walls of sound that creates the Nine Inch Nails reputation. The combination of a Trent Reznor still filled with anger and the world’s coolest guitarist in Robin Finck created an awesome visual impression, which trickled down to the crowd and created front row mosh pits. 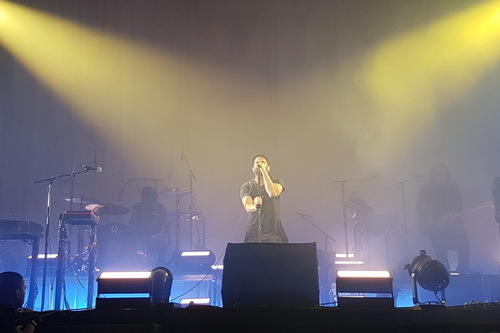 With closing numbers “Head Like a Hole” and “Hurt”, Nine Inch Nails put themselves in the top position on this year’s ”best concert” list. The second day of the festival looked interesting from the start but unfolded as a disappointment. In the schedule we found the new queen of darkness, Chelsea Wolfe, and My Blood Valentine, the loudest band in the world. 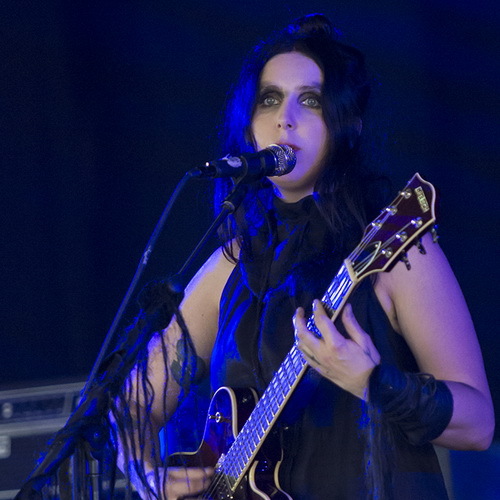 First out was Chelsea Wolfe and her dark goth rock sound with bits and pieces of industrial elements. However, Wolfe should not play in full daylight considering her light show and absolutely not at a time of the day when drunk people stumble around, talking with loud voices. Her performance was strong though, especially during songs like “Iron Moon” and “Color of Blood” but the setting for the show was terrible. The point is that the last time I was at a Chelsea Wolfe gig, at the Way Out West Festival in Sweden, she had a similar time slot. I guess she hasn’t had a breakthrough in Europe, to get the night slot she deserves. Maybe it’s better to catch her on the ongoing club tour instead, where the setting is right and people are actually interested in her work. Festival audiences can be kind of tricky to deal with, especially if the show has been preceded by a football game in the World Cup and people stumbling in are just interested in drinking beers and keep talking (too loud). The next show of the night was My Bloody Valentine, known for their wall of sound – and it sounded completely crap. I don’t know if it’s the Arena stage, I’ve been to quite many crappy sounding shows there, but it worked out well for NIN. However, My Bloody Valentine even appeared too tired to move on stage. At times I thought they just put up dummies on stage and did a playback show. It’s not worth to write anything more about this, it was just a huge disappointment. I went for a beer instead and then back to my tent. The last two days of the festival we didn’t have as much work to do as the previous six days, also counting the pre-festival days. The concluding days didn’t have as many interesting bands either and it was much easier to plan your day running between concerts, football games – yes, we needed to support Sweden in the game against England on Saturday – and bars to relax with well-deserved beers. After an eight-hour break with no interesting bands to watch at all it was finally time for Nick Cave & the Bad Seeds. Like most music nerds I keep some kind of statistics of bands I’ve seen live and could therefore easily find out that this was the ninth time I attended a Nick Cave concert. 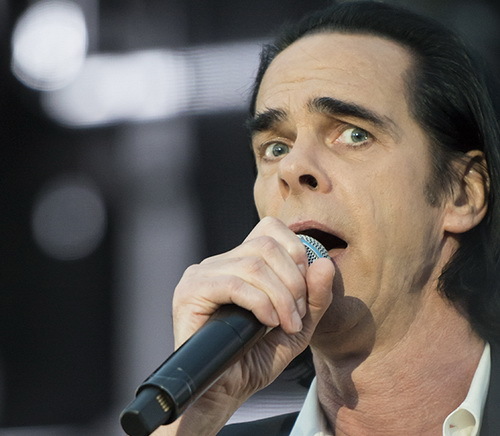 As usual he pulled off a really great show and most artists have quite much to learn – probably everything – from Nick Cave on how to embody their music with the same pain and remorse that he expresses on stage. They can also study how he climbs out to the crowds ,standing on security fence with the help of security guards, to come close to his fans – amazing. Nick Cave is the master, the connoisseur and the genius squeezed into human form, offering the crowds guidance and wisdom through poetry rather than harmonies. And he changes the mood for each new song played. However, if you’ve seen him eight timesit might get a bit boring, but it’s just because everything you do too often gets boring. As a performer though, only a handful artists can compete with Nick Cave. After seven songs a friend fooled me to follow him to some black metal and French act Celeste but I can’t really see the point with it just as I can’t understand why national football teams should sing football songs before the World Cup – sorry guys, it wasn’t for me. Luckily enough my third black metal encounter in life didn’t ruin the night; a few minutes after the show ended it was time for my nineties heroes Massive Attack to enter the Orange stage. Ever since I met one of their founding members, Andy Vowles, in a studio in London in the nineties, I’ve followed the career of Massive Attack. “Blue Lines” and “Mezzanine” were pioneering works in the trip hop genre and opened the gates for many similar acts like Portishead, Tricky and Morcheeba. The light show was simply spectacular. With a massive digital backdrop blasting out political messages on the ongoing xenophobia around the world, due to the migration waves, nothing can go wrong. The digital screen beams intense shapes and colors and lasers slice through dry ice created fog on stage, and it was by far the most oversized light show at this year’s festival. However, Massive Attack 01:00 when you want something danceable to keep six days of bad sleep away is not the best choice. Of course they play major hits as “Teardrop”, “Karmacoma”, “Angel” and “Inertia Creeps” but to me personally it’s in songs as “Girl I Love You” (from their latest album “Heligoland”) and one of the best songs of the nineties, “Unfinished Sympathy”, they really do something exciting on stage. It’s in those songs they make use of Horace Andy and they’re at their best. Saturday was probably the most hectic day of the festival with several interviews and, of course, changes in interview locations and interview times, keeping us in a restless mode until the afternoon arrived and time to relax with a few beers to the World Cup game between Sweden and England. It was quite obvious that seven nights of bad sleep due to hot mornings in the tent and the fact that my feet were on the verge of amputation because of a very bad choice of shoes, and the blisters kept growing. In panic I bought new shoes but it was too late – it was indeed the worst shoe festival ever. It had an impact on our decision-making abilities and we chose football over Myrkur playing a unique set of folk songs. I know what you think, “What the *f-word*“, but if you would’ve seen those blisters under my feet you would have asked for a wheelchair. After the game we went straight to the Mogwai show at the Arena stage and as a huge Mogwai fan I’d been looking forward to my first Mogwai gig in four years, and especially to hear some songs from their latest studio album “Every Country’s Sun”. 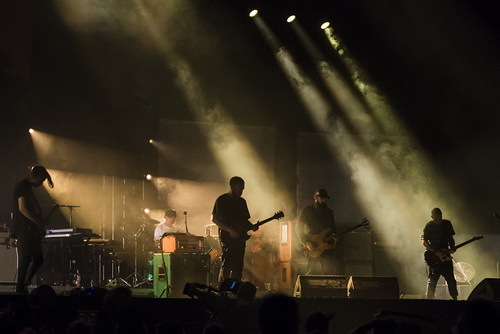 Just like Nine Inch Nails are the pioneering band on the industrial rock scene, Mogwai are the epitome of the post-rock genre. With their albums “Young Team” (1997) and “Come On Die Young” (1999) they reinvented the post-rock scene and brought it from the States to Europe and beyond the American sound of bands like Godspeed You! Black Emperor and Tortoise. But this was the biggest disappointment of all. After just a few songs it was clear that Mogwai’s very slow songs were too much for a tired festival reporter. After the fourth song I almost fell to the ground and realized that it didn’t work out anymore. In the middle of the fifth song I needed to do something and headed to the Pavilion stage for some uptempo indie pop by Sacred Paws. Although I’ve seen Mogwai way beyond ten times and always been very impressed by their wall of sound it didn’t work out on the last festival day where most people want to see some “punch-in-the-face” acts to squeeze-out the remaining strength in their tired bodies. Sorry Mogwai, this wasn’t the best time slot considering a tough festival week. To summarize this year’s edition – it was magic as usual and the weather made it even better. 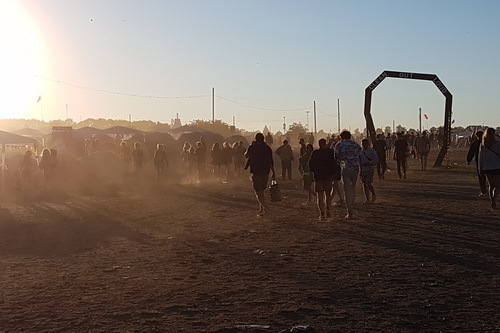 Roskilde Festival has always been special among festivals and once you’ve been there you usually get stuck, not because of the music but for the “Orange feeling” created by those intangible things happening around people, music and partying. It’s like the force in the Star Wars univerase, it’s just there binding everything together, with happiness. Volunteers are always happy and very friendly, the well-armed policemen have as much fun as the festival-goers and always stop for a selfie, workers in the foodtrucks who probably worked in a tent hotter than hell were always in a great mood. 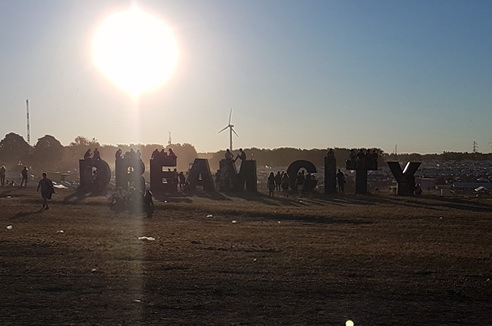 I might be biased since this was my 27th Roskilde Festival experience but after more than 70 different festivals over the world in my work as a sound and light dude I have never found anything similar to the Roskilde Festival when you put all the bits and pieces together – and will probably not find it either.